Lotus Villa is scenically located on Ahungalla Beach, overlooking the shimmering Indian Ocean and it is 125 km away from the Katunayaka International airport. Ahungalla is a picturesque area on the south-west coast of Sri Lanka with a peaceful atmosphere. Lotus Villa’s foremost intention is to offer Ayurveda treatments, Yoga, Thai Chi Chuan and meditation in a captivating setting. 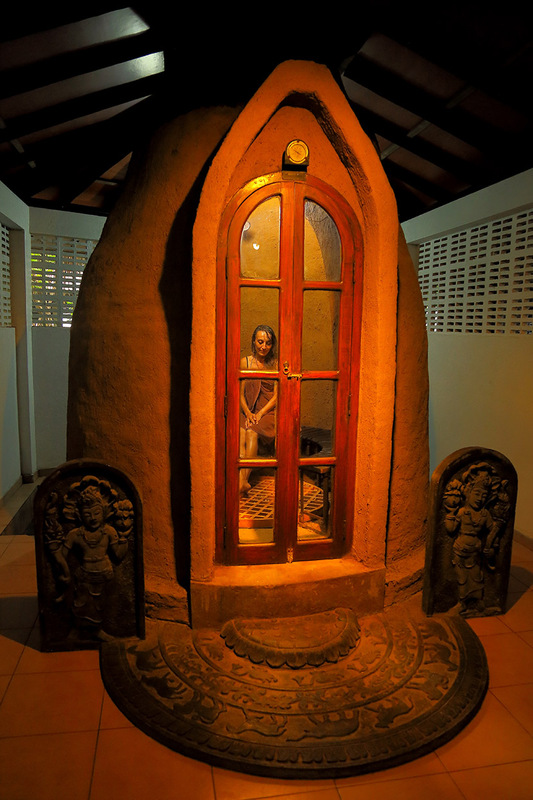 Though Ayurveda is originated in India, Ayurveda in Sri Lanka is unique since it has been enriched with the indigenous healing practices and the Buddhist influence. Ayurveda is a Sanskrit word with the literary meaning of “knowledge of Life”. It is a philosophy which focuses on a long and above all healthy life in the sense of a balanced style of living based on the three pillars of body, mind, and soul. Recovering from a disease and also prevention from diseases are equally important in Ayurveda. Therefore, Lotus Villa is ready to restore your energy with the indulgence of Ayurveda while shedding your worries and anxieties. Lotus Villa is a registered Ayurveda hospital under the Department of Ayurveda in Sri Lanka and it has been growing continuously with more than 25 years of excellence in Ayurveda. Since Ayurveda perceives people as a unique individual, every guest will be provided with a personalized treatment, meal and medicine plan based on the body profile and the intensity of the symptoms when they come to Lotus Villa. Our qualified Ayurveda team is dedicated and always put their full effort to make you satisfied and relaxed. In addition to that, all the medicines are produced at our licensed medical production area with due care using Sri Lanka’s well-grown herbals. Your meals at Lotus Villa will be an unforgettable experience since the culinary art of Lotus Villa is rooted in the tradition of Ayurveda. All the individual meal plans are developed by the team of doctors and the chefs while combining the taste, medicinal value and the presentation. The lush green garden with shady coconut trees may tempt your body to be relaxed from the moment you enter to Lotus Villa. The garden has enhanced its serenity by featuring with a waterfall and a freshwater swimming pool. Clean water which is free from harmful substances is vital for a healthy life. Therefore water utilized at Lotus Villa is purified through a reverse osmosis plant before dispensing. Herbal sauna and the stony oil bath tube for skin treatments are great resources for Ayurveda treatments. Generally, Yoga and the meditation assist in balancing the tri-doshas along with Ayurveda treatment. The Yoga and meditation shelter opening towards the sandy beach is an ideal place to restore your energy in the dawn and dusk. Ayurveda treatments aim to cleanse both, body and spirit by restoring the relative balance of the tri-doshas. Approximately the complete process requires more than a period of one month for the healing. Yet, it is impracticable in the day to day life to spend for a such a long period and we have compressed it to 14 days of stay period. The fourteen days stay is compulsory to ensure the effectiveness of medicines and oils used. On your arrival to Lotus Villa, first it is necessary to relax after an exhausting journey. Then the first consultation will be carried out either on the same day or the next according to the arrival time. Short consultations will also take place throughout your entire stay to keep track of the progress. At Lotus Villa our physicians are always happy to answer any question you might have and do not need to make appointments as there is always a physician in house. The important aspect of the first consultation is the pulse diagnosis. Physicians diagnose the proportion of the doshas (Vata, Pitta, Kapha) and the reason for the physical disorder or illnesses. The chief physician and the team will then prepare the tailor-made treatment plan according to the diagnosis. It includes food, medicine, and treatments. Every day after dinner, you will be provided with the treatment plan for the next day which we hope will help you plan the next day. It is not necessary for you to keep track of time, we will do this for you and the assigned therapist will visit to accompany you for the treatments. 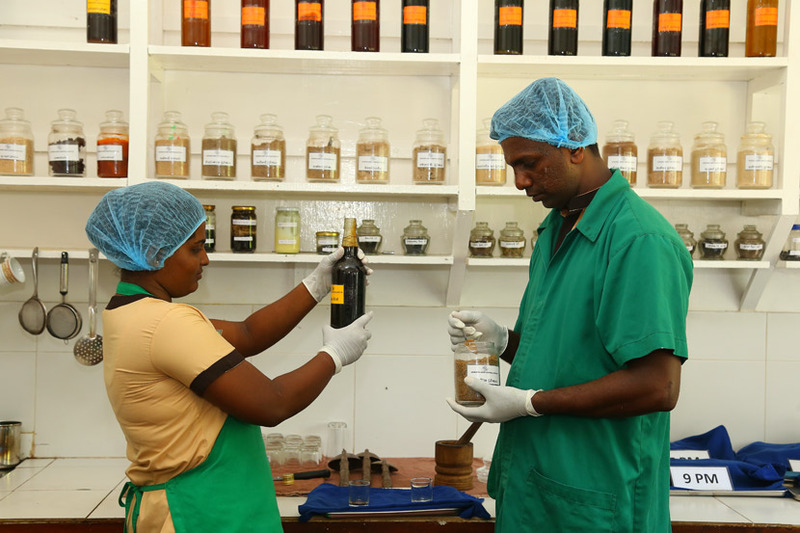 Ayurvedic medicines are made with due care and diligence at Lotus Villa’s licensed medicine manufacturing unit while utilizing Sri Lanka’s well-grown herbals. A team of experts under the supervision of our chief physician uses 120 different ingredients for a single oil. These mixtures are prepared over one or two weeks until it becomes a dark thick decoction. Then the oil is filtered and separated from the decoction. There can be various base oils such as sesame or cinnamon oil. The decoction is then pressed out and small black pills are formed by hand. For every Dosha, there are 48 to 52 oils which can be used for many common diseases. Therefore, we have around 150 different oils in our store. The doctors also prepare individual mixtures and in special cases distill new oils. Almost all the Ayurvedic oils (except those that contain coconut oil) can be stored for a longer period. A detailed lecture on medicine production will be provided during your stay. Further, you can visit our own herbal garden to see the herbal plants utilized for the production of most of the drugs and oils.